Recently purchased a 2000 Accord and wanted to run the amp wire to the battery. Found a grommet on the passenger side just behind the glove box. 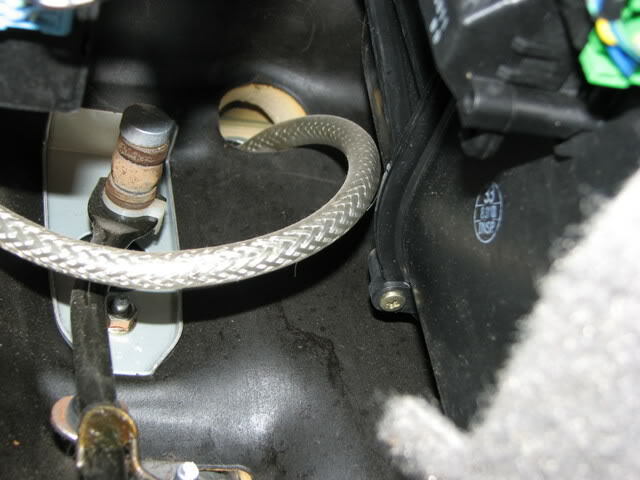 Can not get a coat hanger to go into the interior of the car as there is a hard plastic surface at behind the hole in the firewall. Does anyone know if it is safe to drill thru that surface to gain access to the interior of the vehicle? what side of the car is your battery on? battery should be on the driver's side. above the gas pedal is a good spot to go through. there is a spare grommet there behind the factory sound barrier material (you can see it in the engine bay). my build log should have pictures. obviously, this is before split loom and zip ties to hide it, but this pic was to show the location of the wire. battery is on the passenger side. I will check out the extra grommet near the gas pedal. thanks for the input. any idea what is located behind the opening in the firewall that I mention when I started this thread? If is on the passenger side directly behind the glove box. keep_hope_alive...GOOD FIND. I used the opening above the gas pedal and it was a piece of cake. THANK YOU!!! good deal. you still need a grommet there. you can drill out the plastic grommet for your wire size if it is small enough. always use a rubber grommet to protect the wire and seal moisture. Now I have another issue. My amp will be mounted under my passenger seat. What is the best source for a ground point. I see several bolts securing the seat. Would one of these bolts be a good grounding point?